There is less than 18 months to go until the International Maritime Organization’s (IMO) global 0.5 per cent sulphur cap comes into force. From the 1st of January 2020, the marine landscape will dramatically change and many questions still remain unanswered. Vessel operators will need to take extra care in the face of this uncertainty as there are a number of issues that will likely require managing when the revised sulphur cap arrives. Amongst these issues comes the increased likelihood of compatibility problems, along with the chance of heightened levels of cat fines. Unless operators opt to install abatement technology known as scrubbers, and continue to burn heavy fuel oil (HFO), it will be therefore essential for the marine industry to prepare for the switch to compliant options and develop a set of actions that will minimize the risks associated with the move to new low-sulphur fuels. For operators choosing to switch to compliant fuels, the first step should be to establish practice as ‘prevention is always better than the cure.’ It is therefore advisable to buy fuel that meets the latest ISO 8217:2017 specification whenever possible. Vessel operators should also only bunker from reputable fuel suppliers and it is advisable to clean out tank residues prior to the IMO deadline as they are likely to contain HFO sediment, which could contain high levels of sulphur. Unless this is removed there is the risk that it will contaminate compliant fuel, pushing its sulphur content above the 0.5 percent limit. In order to minimize this risk, ship owners could flush fuel tanks with marine gas oil (MGO) or an ECA fuel to remove sludge deposits. This process may need to be repeated, depending on the amount of sludge present. ExxonMobil recommends that tanks bottoms should be manually cleaned as a precaution against non-compliance. Some new compliant fuels available could contain elevated levels of cat fines which, if not properly treated, could trigger catastrophic engine damage. If laboratory testing shows a high concentration, then action needs to be taken. Fortunately, cat fines have a higher density than the fuel oil in which they are contained and will readily settle if water isn’t present. To aid this action, on board personnel should remove water, maintain storage tank temperatures at least 10°C above fuel pour point and keep settling tanks at 85°C. Where possible, crew should also use two settling tanks on a rotational basis to extend the settling time. Purifiers must also be operated at optimum efficiency to ensure as many of the cat fines can be removed from the fuel as possible. There is a risk that two compliant fuels will not be compatible, which can trigger damaging sludge formation. It is therefore essential to test the fuels for compatibility, ideally in a laboratory. If fuel has already been loaded onto the ship, crew can test on-board for immediate results. Fuels should also be stored separately until testing has been carried out. Beyond this, if mixing is unavoidable, avoid comingling in excess of 80:20 mix ratios. Fuel compatibility issues must be treated as a critical concern as they can result in the formation of sludge, which can block strainers, filters and purifiers, resulting in costly and avoidable maintenance. In the worst case scenario, sediment and the resultant sludge can cause engine fuel starvation and power loss. If sludge does start to form it is essential to ensure against further fuel blending before any remedial action is taken as this may exacerbate the problem. Ship owners should then operate two or more separators in parallel at their lowest throughput, increase the frequency of purifier discharge and monitor and clean filters frequently. With so many different types of fuel potentially set to enter the bunker market, vessel operators are rightly concerned about stability, compatibility and quality issues, such as elevated levels of cat fines. It will therefore be more important than ever for operators to follow best practices when bunkering compliant fuels, including the employment of recognized, reputable laboratories to test fuel samples for potential issues. As part of this process, vessel operators should work with a trusted fuels supplier with the experience and knowledge to help them navigate the way through the challenges that lay ahead. John LaRese is the Technical Advisor for ExxonMobil Marine Fuels. He has been with ExxonMobil for over 39 years. Most of his career was spent on-board affiliate Tankers as a Chief Engineer, sailing on-board affiliate VLCCs, Product and Chemical Tankers. He has been ExxonMobil’s Marine Fuels Technical Manager since 2009. A large portion of his current position focuses on the development of 0.5% Sulphur Compliant Marine Fuels. LaRese graduated from Maine Maritime Academy in 1979 with a B.S. in Marine Engineering. 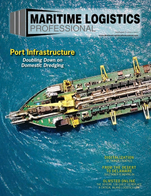 This article first appeared in the JULY/AUGUST print edition of Maritime Logistics Professional magazine.